Niamey - An ambush on a joint US-Niger patrol has left several soldiers dead, a security official said Wednesday, as fears increase that a conflict in neighbouring Mali is spilling over the African nation's border. Three American special forces troops were among the dead, according to a New York Times report citing US military officials. The attack marks the first US combat casualties in Niger, where Washington provides training and security assistance. A local security official told AFP that the attack, which took place in the western Tillaberi region, close to the Mali border, also claimed the lives of several Niger soldiers. The ambush was "probably a terrorist attack", the official said. "We have lost elements. The ambush attack by heavily armed men from Mali targeted a patrol of Nigerian and American soldiers - instructors," a source in Tillaberi told AFP. 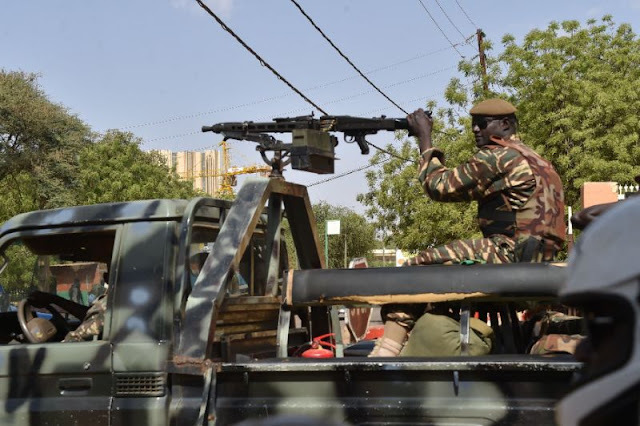 According to Radio France Internationale (RFI) the ambush took place after militants from Mali attacked the village of Tongo Tongo in Tillaberi on Wednesday. A counter-operation was launched, but the American and Niger soldiers fell into a trap, according to the radio report. The New York Times said that three US Green Berets were killed in the ambush and two others injured. White House spokeswoman Sarah Sanders told reporters in Washington that US President Donald Trump had been told "about Niger" without giving further information. It is the first time that the presence of American soldiers has been reported in the area, which has become unstable due to lethal attacks attributed to jihadist groups targeting Niger army positions and refugee camps. In mid-September, Niamey extended a state of emergency in force since March to the zone due to a terrorist threat coming from Mali. In mid-June, the Nigerian army mounted a new military operation in the Tillaberi region to take on the jihadists. The United Nations later warned that the conflict in Mali was spilling over to Burkina Faso and Niger, after a significant surge of attacks by extremist groups in border areas. The UN has 12,500 troops and police serving in the MINUSMA force in Mali, considered the world body's most dangerous peacekeeping mission. An ambush on a joint US-Niger patrol has left several soldiers dead, a security official said Wednesday, as fears increase that a conflict in neighbouring Mali is spilling over the African nation's border.